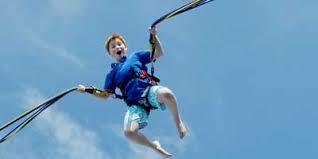 The Bungee Trampoline Jumper allows you to use a trampoline and bungees to do flips and send you flying in the air. Anyone can jump on the bungee trampoline with a weight of 20-200lbs and in good physical condition. Located on the Downstairs level.